Offered for sale with NO ONWARD CHAIN and having been the subject of much updating by the current owner, yet still retaining much character, is this spacious 4 - 5 bedroom and 2 - 3 reception room, 1920`s detached house with gardens, off road parking and detached garage. Improvements to the property includes re - wiring, brand new central heating system and creation of off road parking for 2 - 3 motor vehicles as well as plastering, re - decoration and carpets. The uPVC double glazed accommodation comprises, on the ground floor, of modern fitted shower room, dual aspect Sitting Room / Bedroom 5, Bay fronted Living Room, Dining Room, Kitchen & Small utility. On the first floor are 4 further Bedrooms, 2 with En - Suite WC`s, bathroom and further Cloakroom. Subject to gaining the usual planning consents, the loft could be converted to provide further living accommodation if required. 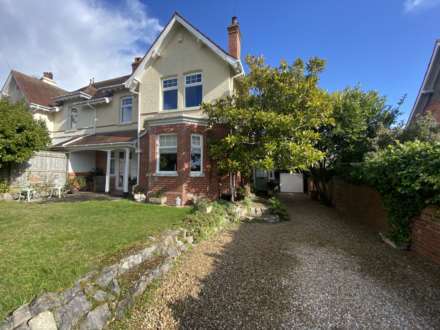 Situated within level walking distance of Phear Park, Exmouth Town Centre, Train Station and Schools, this property would, perhaps, make an ideal family home and an appointment to view is therefore advised. Dual aspect having windows to front and side. Newly fitted, coal effect, gas fire in fireplace surround. Radiator. Ornate coving. Brand new fitted carpet. Dual aspect having walk - in bay window to side and window to rear. Focal point of fitted coal effect fire within a fireplace surround. Radiator. Laminate flooring. Dado rail. Ornate coving. Dual aspect having window to front, window to side and uPVC double glazed external door to side. Range of cupboard and drawer storage units with Granite work surfaces and tiled splash backs. Stainless steel single sink and drainer unit with mixer tap. The Range style cooker in situ is included in the sale. Space and plumbing for dishwasher. Further space for freestanding fridge / freezer etc. Newly fitted, wall mounted, gas fired combi boiler supplying the central heating and domestic hot water. Obscure uPVC double glazed window to side. Shower area with electric shower unit. White suite of low level WC and vanity wash hand basin. Fully tiled walls and floor. Heated towel rail. Window to side. Focal point of ornate, cast iron fireplace with a marble surround. 2 fitted double wardrobes. Storage cupboards, with worksuface above, within chimney breast. Radiator. Brand new fitted carpet. High skirting boards. Coved ceiling. White suite of low level WC and wall mounted wash hand basin. Tiled splash backs. Tiled flooring. Extractor fan. White suite comprising low level WC and wall mounted wash hand basin. Heated towel rail. Extractor fan. Window to front. Radiator. Brand new fitted carpet. High skirting boards. Coved ceiling. Obscure glazed window to front. White suite comprising panelled bath with mixer tap and shower attachment, low level WC and pedestal wash hand basin. Fully tiled walls. Radiator. Access to loft storage space. Obscure uPVC double glazed window to side. White suite of low level WC. Tiled splash backs. From the kitchen door, an extensive patio area is ideal for outdoor dining and sitting during the fine weather. Timber garden shed. Outside water tap. Rendered wall and timber fenced boundaries. Steps down to garage. To the front and side of the property is the level gardens that are laid mainly to lawn with a couple of patio areas being ideal for outdoor dining and sitting during the fine weather. Brick wall and timber fenced boundaries. Timber Summerhouse. Timber shed. Outside power points. Pedestrian access via timber garden gates. Off road parking has been created for up to 3 motor vehicles. An irregular shaped garage. Roll up and over door to front. Personal door to side. Power and light connected. From our prominent Town Centre office, turn right into Rolle Street, Past The Starnd Gardens, turning left, then right, at the roundabouts passing Exmouth Train Station. Proceed into Exeter Road and after the traffic lights, turn right into Lyndhurst Road where the property will be found on the left hand side, clearly identified by our For Sale Sign.